FERRARIO - [ Mortuary scene. Tahiti Islands ]. FERRARIO, G. - [ Mortuary scene. Tahiti Islands ]. [ Mortuary scene. Tahiti Islands ]. - FERRARIO, G.
Title : [ Mortuary scene. Tahiti Islands ].. Size : 6.7 x 9.1 inches. / 17.0 x 23.0 cm. 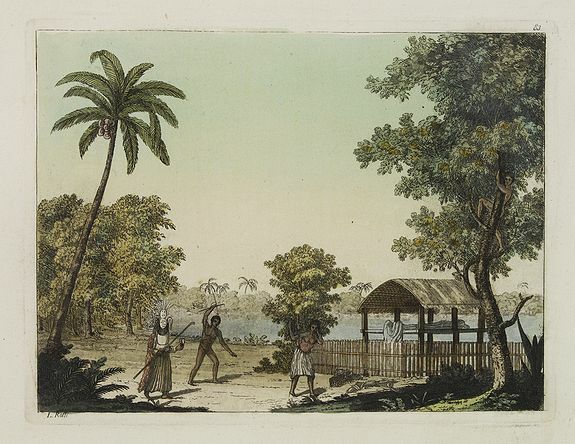 Description :Aquatint depicting a mortuary scene in front of a tapapow, a shed under which the dead bodies remains are exposed until they dry. Engraved by Roffi. Plate N° 83.